Although bone button molds can be used to make "death head" buttons, the wooden ones work better as the rough texture of the wood helps hold the threads in place. 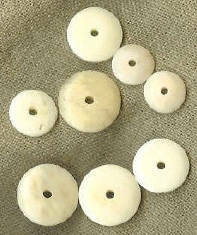 Fabric-covered buttons can also be made with the wood molds but, if the garment will be washed, bone molds will hold up better. Directions for cloth covered buttons are included in The Lady's Guide to Plain Sewing [Book II].